Parker played Burt Reynold's rival Aubrey James in this NASCAR racing comedy. Aside from being pushed on a stretcher into a pool, he mostly gets to play it straight, which was for the best. Parker can be very funny, but he tends to do better with dry or eccentric humor rather than the kind of broad slapstick you find a Burt Reynolds movie. Parker brought real-life racing experience to the role, having competed previously in such competitions as a 3,200 mile Safari Race in Kenya. Buy Stroker Ace on DVD from Amazon.com! Buy Stroker Ace on VHS from Amazon.com! Burt Reynolds. . . asked Universal, the company that was financing the film, to cast me as his nemesis. But the studio did not want me in the role. They wanted someone who fit the description a little better than I did - the character was supposed to be someone who had scars all over his face, huge biceps and who looked like he had spent twenty years in prison. In other words, he was supposed to be an animal. Burt had the sense to know that this wasn't me, and that wasn't how I would play the role. So he said to the studio, "C'mon, this guy's an actor. Give him a break. He'll bring something different to the role." The studio finally agreed to use me. Burt really stuck his neck out for me, and for that, I'll always be grateful. "Stitches" is unquestionably the lowest point in Parker's career. * This medical school comedy is completely tasteless, and is lousy even for the genre of deliberately sophomoric comedies. It was so bad that the director exercised his right to have his name removed from the picture. "Alan Smithee," who is credited as the director, is the Director's Guild pseudonym used when the actual director doesn't want his own name associated with a film. It's been a long time since I've seen this film. (Once was more than enough!) The one scene I liked, the only one in which Parker didn't seem horribly out of place and mis-cast, occurs when his character Bobby is nearby when someone has a heart attack. In a complete change from his otherwise irreverent and obnoxious behavior in the rest of the film, he immediately starts doing CPR and saves the man's life. The dean of the school, whom Bobby has been treating as an enemy, happens to be nearby and commends him. They have a conversation about Bobby's attitudes and his future as a doctor. It's a nice series of moments, and Parker is completely convincing. It's the only scene worth viewing in the entire movie. Q: How did you get involved in auto racing? 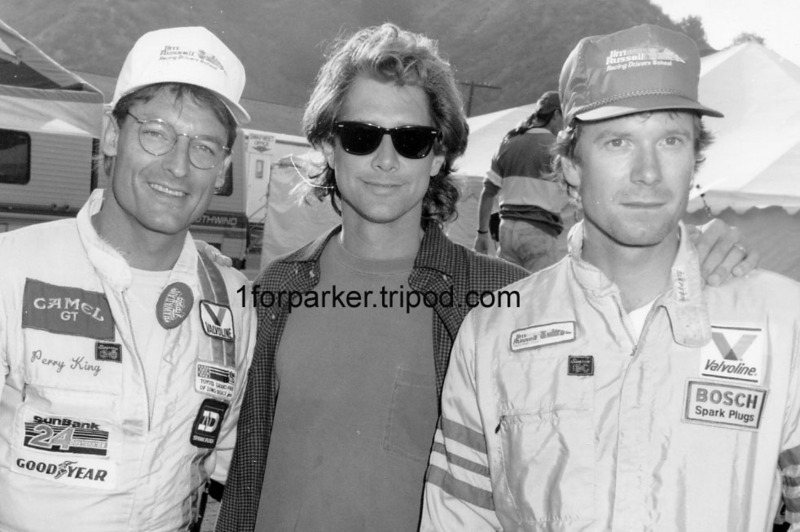 Parker at the track with Perry King and William R. Moses in 1990. 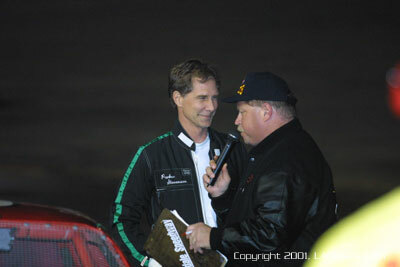 At California's Irwindale track in November, 2001.